← It’s Boxing Day. What are you going to do today? A group of scientists, journalists and volunteers on an excursion to Antarctica have had an even whiter Christmas than they dreamed of, as their ship became trapped in heavy ice off the coat of Antarctica on December 25. The Australasian Antarctic Expedition (AAE) commemorates the 100th anniversary of Sir Douglas Mawson’s expedition to the eastern Antarctic. The current voyage aims to replicate many of the measurements made by Mawson’s crew in 1911-13, to record changes in the region over the last century. Two journalists from the UK’s Guardian, Alok Jha and Laurence Topham, are aboard the ship and have been blogging and tweeting about the expedition as it made its way to Antarctica. On December 26, Jha reported that the ship, the MV Akademik Shokalskiy, had been hit by a blizzard on Christmas Eve. By Christmas day, it was beset by ice and unable to move. Yesterday, December 27th, a Chinese ice-breaking ship, the Xue Long, attempted to reach the Akademik Shokalskiy but was unable to navigate through the thick ice. You can follow the Guardian’s coverage of the AAE in its special Antarctica Live section and follow Alok Jha on twitter. 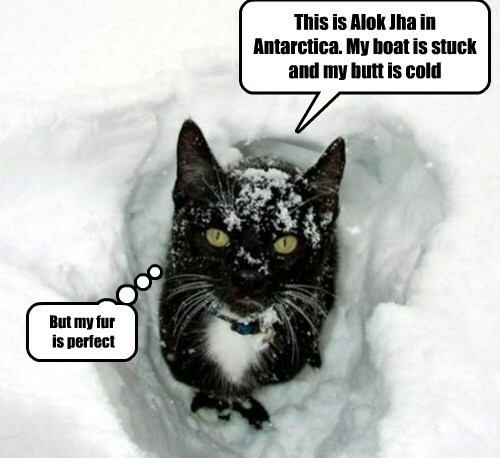 This entry was posted in Science Caturday and tagged AAE, Alok Jha, Antarctic Expedition, Antarctica, Antarctica Lolcat. Bookmark the permalink.